It begins, as the best superhero stories do, with a tragic accident that has unexpected consequences. The squirrel never saw the vacuum cleaner coming, but self-described cynic Flora Belle Buckman, who has read every issue of the comic book Terrible Things Can Happen to You , is just the right person to step in and save him. What neither can predict is that Ulysses (the squirrel) has been born anew, with powers of strength, flight, and misspelled poetry -- and that Flora will be changed too, as she discovers the possibility of hope and the promise of a capacious heart. 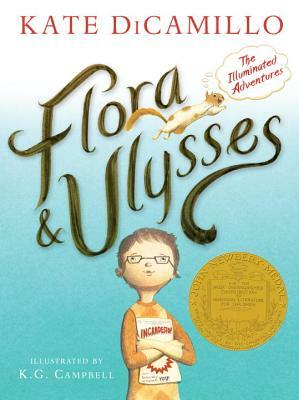 From #1 New York Times best-selling author Kate DiCamillo comes a laugh-out-loud story filled with eccentric, endearing characters and featuring an exciting new format -- a novel interspersed with comic-style graphic sequences and full-page illustrations, all rendered in black-and-white by up-and-coming artist K. G. Campbell. Kate DiCamillo is the author of many beloved books for young readers, including The Tale of Despereaux, which received a Newbery Medal; Because of Winn-Dixie, which received a Newbery Honor; The Tiger Rising, a National Book Award Finalist; The Miraculous Journey of Edward Tulane, winner of a Boston Globe-Horn Book Award; The Magician's Elephant; and the best-selling Mercy Watson series. Kate DiCamillo lives in Minneapolis. K. G. Campbell is the author-illustrator of Lester's Dreadful Sweaters. He was born in Kenya, raised in Scotland, and now lives in southern California.